Dissolve black currant and greengage jellies alternately with 225 ml boiling water. Add 225 ml cold water and stir. Wen set, take the lemon jelly & dissolve to 250ml boil water. Remove the blackcurrant & greengage jelly from fridge and cut up in 1cm squares. 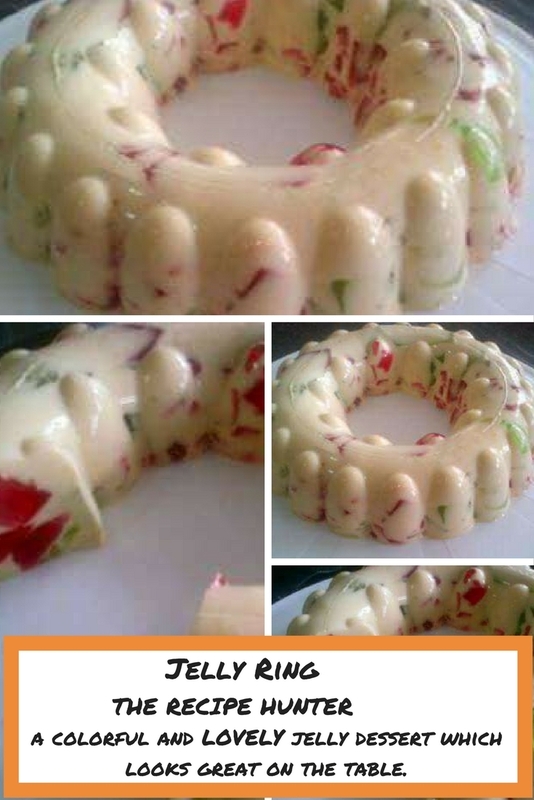 Place squares in Tupperware jelly ring mold. Mix the chilled ideal milk with lemon jelly & pour mixture over greengage and blackcurrant squares in the mold and set in the fridge. When set you can turn it out onto cake stand & fill the center with cut fruit, kiwi & strawberries and pour custard over the ring. Thanks Suzie. Glad you like it.